Preheat oven to 350 degrees. Cream butter and sugar until fluffy. Add pumpkin, egg and vanilla and mix well. Combine flour, baking powder, baking soda, salt, cinnamon and nutmeg. Stir into butter mixture until well blended. 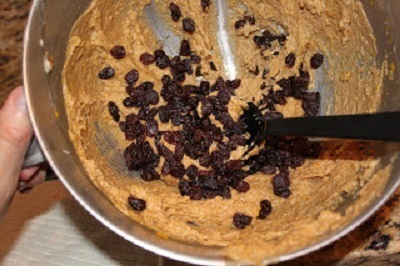 Add nuts and raisins. Drop by teaspoonful onto parchment covered baking sheet, about 2 inches apart. Bake about 15 minutes, or until golden. Cool. Icing: Cream confectioners' sugar and butter. Add remaining ingredients and beat until smooth. (If icing is too thin, add more confectioners' sugar; if too thick, add rum.) Drizzle over cookies. That's cute. Can I have both? wow fantastic!! very good for a gift to my friend. Difficult decision! I'll take both! Who can choose?! One of each please. Great cookies, but the rum icing totally hooks me! I would definitly have to have both. YUM! These look good! And the rum frosting?! Yummy! I like raising AND chocolate chips...I think I'll use both! These sound excellent, loving the rum frosting idea, yum! Love it! It's like getting two cookies for the price of one. The bonus being if you like both - which I do! I'll put the chocolate and raisins together and call it a day. This a new holiday cookie for me and pumpkin spice always delivers. As do you.